IN THE NEWS – North Shore responded to a large diesel fuel spill Sunday, after more than 30 buses had been engulfed in flames at the Dousman Transportation Company in Merton. In total, 35 buses as well as the bus barn were destroyed by the fire . “Normally if you had a fire, that fuel would probably go up in the fire. A lot of that diesel might have burned up in the fire – but when they`re throwing water on it and it`s maybe coming out of the tanks, it`s also flowing out with the runoff,” Keith Hitzke said. North Shore Environmental Construction, Inc (NSEC) participated in a boom deployment drill at Horicon Marsh. The drill scenario was a release of 50,400 gallons of diesel fuel that entered the Rock River, West Branch and traveled south along the river. Emergency response agencies were stationed at various river banks and locations surrounding Horicon Marsh. No oil or petroleum products were used in this exercise, only the actual deployment of containment boom. The purpose of this exercise is to ensure that emergency response personnel are trained to respond to a marine spill. Most training and drills are multi-agency led, and attended by local response agencies. The joint response teams for this drill comprised of various Fire Departments, Hazmat teams, Hazmat contractors, EPA, Wisconsin DNR, local businesses and the Oil Spill Response Organization (OSRO) personnel. The exercise consisted of hands-on boom deployment, which provided local responders with practical training in boom handling, deployment, watercraft maneuvering, and testing of local response capabilities. The purpose of placing boom in a body of contaminated water is to divert the contamination to a collection point. 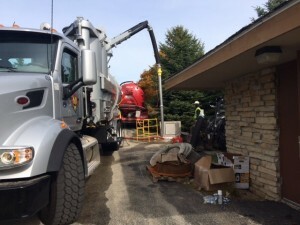 Booms help concentrate oil and petroleum in thicker surface layers so that skimmers, vacuums, or other collection methods can be used more effectively to remove the oil and petroleum from the surface of the water. NSEC discussed proper placement of the boom in the river with the emergency response personnel. NSEC had their marine spill response unit on site. Project Managers from NSEC discussed how to use their marine equipment with the emergency response personnel. The marine equipment consists of containment boom, a double drum skimmer, a jon boat and motor and a truck skimmer. For more information about boom deployment and responding to a marine spill, please contact NSEC. North Shore Environmental Construction, Inc. (NSEC) has purchased a Gasmet DX4040 FTIR (Fourier Transformed Infrared) gas analyzer. NSEC has now extensively trained its staff on the use of the real-time FTIR and has implemented its use to measure real-time measurement of gasses. This state-of-the-art technology allows NSEC to “take the lab to the jobsite” and to quantify the known gasses and identify the unknown gasses present. This whitepaper highlights the strengths, limitations and modern technology associated with FTIR real-time gas detection, to provide a better understanding of how this instrument can be used for various real-time gas detection scenarios. It also highlights the state-of-the-art in FTIR technology and why this technology is suitable for emergency response scenarios, and some well-respected governmental agencies use this technology. The Gasmet DX4040 portable FTIR (Fourier Transformed Infrared) gas analyzer is a highly technical, portable instrument that is capable of performing multi-component gas analysis from ambient air. This portable instrument contains an FTIR spectrometer that detects specific vibrations, rotations and combinations of molecules within a compound by measuring the compounds’ specific absorbance of infrared radiation. Due to the fact that the infrared absorption spectrum is unique to each specific gas molecule and compound, the analyzer can identify and quantify compounds present in the ambient air. Further, it can accurately and simultaneously identify and quantify up to 25 compounds in a matter of seconds. The portable nature of the analyzer allows a technician to easily transport it around a facility or area and measure the concentrations and identify unknown compounds. This makes the FTIR an invaluable instrument for first responders, occupational and environmental safety personnel, and countless other applications. The FTIR communicates with a handheld PDA that can provide the real-time airborne concentrations of 25 compounds. The FTIR is accompanied with the Calcmet Software which can be used to retrospectively analyze the measured spectra using the Calcmet Software reference library of thousands of compounds. The reference spectrum contains the known spectrum of identified gases with unknown gasses can be compared to identify the specific compound(s) and concentration present. Specific gas libraries include hydrocarbons, organic compounds, and inorganic compounds. A few strengths of the instrument include that preparation for the sampling is not required, it provides real-time results, and it is portable with battery operation with wireless communication to the PDA. The shortest sampling time for gasses is five seconds and typical response time is less than 120 seconds, the quickness and availability of real-time results allows the field technicians to perform expeditious decision making to protect workers, as well as save time and money. Additionally, the analyzer has stable calibrations which means that no regular consumables are required to maintain the device (no span calibrations required) and no recalibration is required. Further, low concentrations of organic and inorganic compounds can be detected and, as previously mentioned, 25 gases can simultaneously be monitored with more analyzed post-measurements using the Gasmet software spectra reference library. There are a few limitations to the FTIR, including it cannot be used in wet, extreme heat or cold environments (short term sampling temperature range is 0 to 40°C and the long term temperature range is 5 to 30°C); therefore, it can only operate at ambient temperatures. Further it should be noted that, all gases absorb infrared light except diatomic homonuclear molecules (O2, N2, H2, Cl2, F2), metals (mercury and lead), the noble gases (He, Ne, Ar), and hydrogen sulfide (H2S) which is a very weak infrared absorber; therefore the FTIR is not the preferred or recommended instrument to identify and quantify these compounds. For real-time analysis the compound(s) needs to be previously selected as the 25 reference compounds; however, up to 50 compounds can be evaluated simultaneously from the spectra and additional compounds can be identified and quantified post-measurement using the Calcmet PC software. The use of the PC software requires additional time but can be performed much more rapidly than sending samples for traditional laboratory analysis. • Other compounds including vinyl chloride, methylene chloride, ethylene dichloride, Freons, sulfur gases, and amines. • First responders & HAZMAT teams – Identification and quantification of Toxic Industrial Chemicals (TICs) and Chemical Warfare Agents (CWAs) and fire investigations. NSEC would be happy to discuss and demonstrate the technology for your organization. NSEC maintains the Gasmet DX4040 and a highly trained field technician on a 24 hour, 7-day per week basis to respond and measure a wide-variety of airborne contaminants. Additionally, NSEC has a 40-hour HAZWOPER-trained, on-call Certified Industrial Hygienist (CIH) and toxicologist to assist in data interpretation, sample planning, human health evaluation and regulatory compliance issues for NSEC’s clients. A Chemical Reaction = A Very Dangerous Situation. Two chemicals that should never be combined were and it created a major reaction inside a tank. The tank exploded. The gas fumes caused irritation and respiratory issues to employees near the reaction site. More than 100 employees were forced to evacuate the premises. 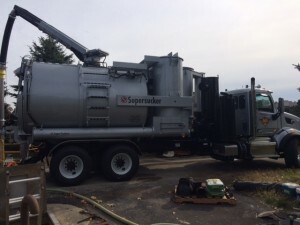 North Shore was contacted to cleanup the spill after the fire department sprayed a couple thousand gallons of water at the source of the spill. Since the gas fumes were an issue and employees had to evacuate the premises, North Shore performed a health and safety investigation to measure the gas level. 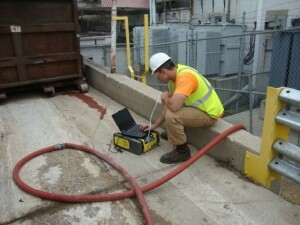 North Shore brought their portable FTIR Gasmet DX4040 gas analyzer to identify the gas level. 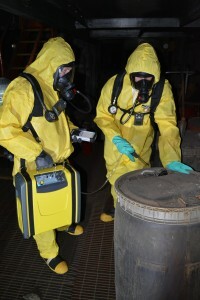 The probe of the Gasmet DX4040 was taken to the explosion site by firefighters while the Gasmet DX4040 and technician were positioned outside the entry. Once the gas level was determined, the site was turned over to North Shore to finish the cleanup. North Shore specializes in hazardous materials response and clean-up and field-based environmental construction. The Gasmet DX4040 can detect up to 25 gases simultaneously providing validated, real time results in 60 seconds or less. 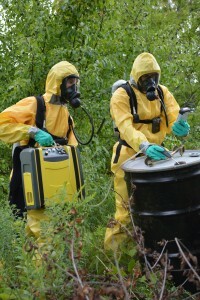 It has helped validate cleanup activities and provide confirmation of safe working conditions during remediation work. Play Ball! North Shore Environmental Construction has been a sponsor of the Germantown Little League for many summers. North Shore is excited to support the Germantown Little League this summer and happy to be a part of the community. Germantown Little League is dedicated to building character, courage and loyalty in local area youth by providing a fun, safe and competitive baseball program. We are currently accepting employment applications for our Haz Mat Technician position. For more information on what we do visit us at www.nsecinc.com. Dave Johnson has been promoted to Vice President of Operations at North Shore Environmental Construction, Inc (NSEC). In this role, Dave will be responsible for the management of NSEC operations and personnel. Congratulations! 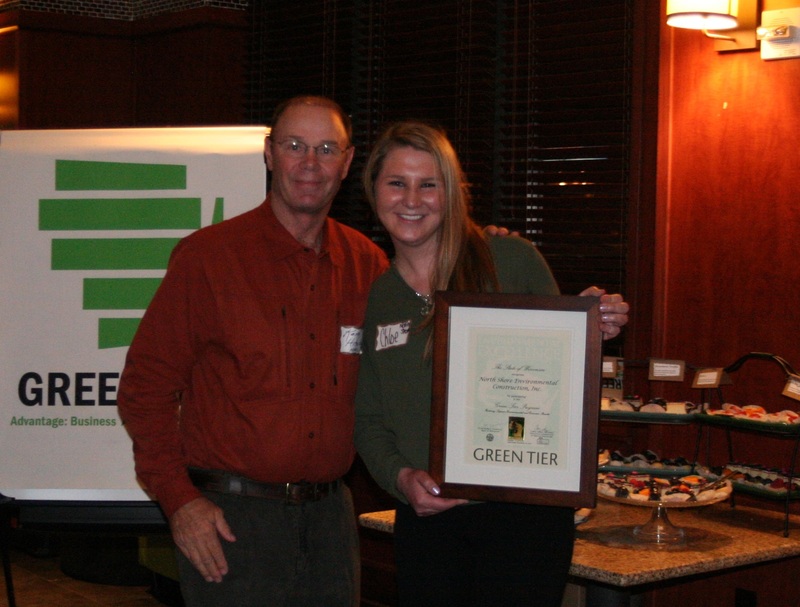 The Wisconsin Department of Natural Resources (DNR) recognizes North Shore Environmental Construction, Inc. (NSEC) for participating in the Green Tier Program. A formal initiation event was held on November 12th at Bar Louie’s at the Bayshore Town Center in Glendale, Wisconsin to honor NSEC’s participation in this program and their current achievements. 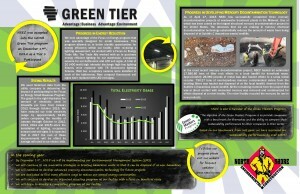 The Green Tier Program recognizes companies that aim for environmental excellence. 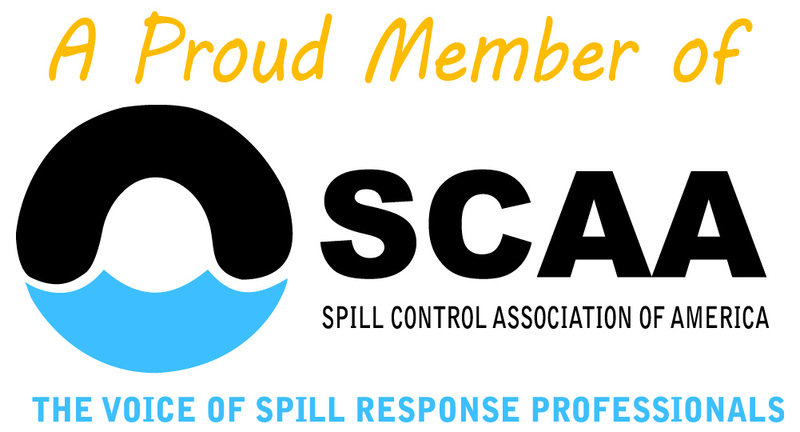 Since 1989, NSEC has been working to protect the environment by providing clients with services in hazardous and non-hazardous materials management, transportation and disposal, emergency spill response, industrial and environmental services and remediation. As a Green Tier Participant 1, NSEC will continue their efforts to surpass environmental regulatory standards and build on its Environmental Management System. NSEC will focus on waste reductions, recycling options and energy use reductions. A big thank you to Chloe Soik, Assistant Project Manager, for enrolling NSEC in the Green Tier Program. She completed the application and submitted our plan to the WDNR for approval. 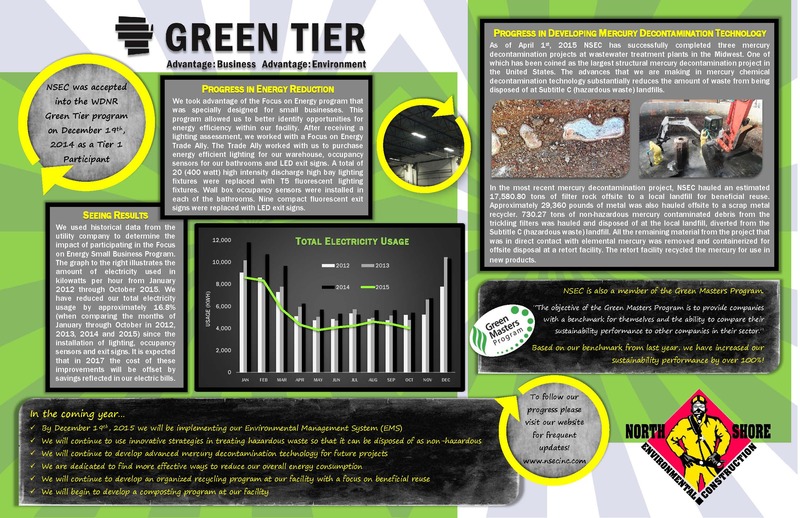 She has been diligently working on NSEC’s waste and energy use reductions and recycling program. 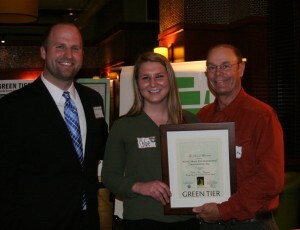 Chloe coordinated our initiation event with the WDNR, our clients, friends and family. Left to right is: Jesse Jensen (Acting Secretary Director, Southeast, WDNR), Chloe Soik (Assistant Project Manager, NSEC) and Keith Hitzke (President, NSEC). Left to right is: Chloe Soik (Assistant Project Manager, NSEC) and Keith Hitzke (President, NSEC). North Shore Environmental Construction, Inc. (NSEC) just got better! NSEC provides yet an even faster and effective solution to cleaning up waste. NSEC recently purchased a Supersucker (a high velocity air mover) to remove industrial and environmental waste and provide facility maintenance, tank cleaning, utility and underground service, hydro excavation and bulk material recovery. The Supersucker is an effective application for both easy to reach areas and hard to access areas. 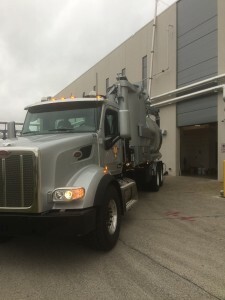 The system removes bulk materials from confined space areas, silos, tanks and interior areas of buildings when traditional equipment is not efficient nor as effective. The system can handle all non-flammable materials in both solid and liquid form. It has a 6000CFM Blower. ‘It can simultaneously load and transfer waste by using the sludge pump accessory, which is capable of moving up to 500 gallons per minute gpm. Want to see how a Supersucker works? Contact NSEC for your next project. Always put safety first, surround yourself with the best personnel and resources, and let’s get your site back to business. Quantify the Known….Identify the Unknown. North Shore Environmental Construction, Inc. (NSEC) is leading the way. NSEC recently purchased a portable field-based Gasmet DX4040 FTIR gas analyzer. The DX4040 can detect up to 25 gases simultaneously providing validated results in 60 seconds or less. It identifies known and unknown gases in seconds, and produces outstanding lab quality data in the field. The portable Gasmet™ DX4040 FTIR gas analyzer is a Fourier Transform Infrared Spectrometer. The DX4040 is one of the most powerful instruments available for on-site rapid identification and quantification of toxic gases. A FTIR detects gaseous compounds by their absorbance of infrared radiation. The 25 gas library of measured gases can be changed in the field (select from a master library list of ~250 gases), and by using the Advanced Library search function, over 5,000 gases can be identified in the field. This provides the ability to respond to any required measurement and especially useful in situations where unknown gases are encountered. By using this technology, NSEC provides optimum performance in demanding situations.